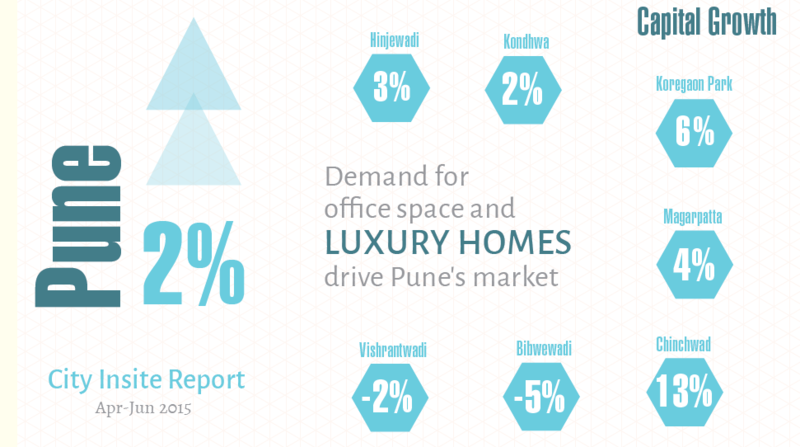 Pune’s real estate market chugged along well with increase in demand for commercial space. While residential demand remained low with buyers adopting a wait-and-watch mode, market for luxury properties saw an upward movement due to demand from the NRI segment. In line with the general sentiment across all major real estate markets in the country, Pune too depicted a subdued residential market in Apr-Jun 2015 as against Jan- Mar 2015, recording an average growth of two per cent. The city witnessed a significant drop in the number of new launches in the last one year. The second quarter of 2015 remained largely passive as far as new launches were concerned with the number of ready and under-construction units posting almost no change Q-o-Q. While sales remained passive in the last six months, NRIs and HNIs kept the luxury market burgeoning. Also, commercial uptake improved in the Secondary Business District (SBD) areas as well as in localities surrounding Hinjewadi, indicating a residential revival on the cards. The long pending announcement of Pune metro project with underground and elevated corridors is expected to boost property prices. With the new IT Policy, residential properties around IT companies are expected to witness a surge in demand and prices. The state government has proposed that companies can develop ‘critical infrastructure’ like approach roads connecting to highways besides providing basic amenities such as water, sewage etc. In lieu, they will be given rebates in property tax and premiums paid to the government for higher Floor Space Index (FSI). Initiatives by the Pune Municipal Corporation (PMC) such as the MoU with GRIHA (Green Rating for Integrated Habitat Assessment) and measures to ensure more water supply for the city are expected to impact the real estate market indirectly. The capital market in Pune remained largely stable with more than 60 per cent of the tracked localities showing a rise in capital values in Apr-Jun 2015, as against the previous quarter. This resulted in an average growth of two per cent in values during this period. Localities on the peripheries and outskirts of the city recorded the highest rise in capital values. Increased demand on the back of affordable properties and investor speculations resulted in this trend. 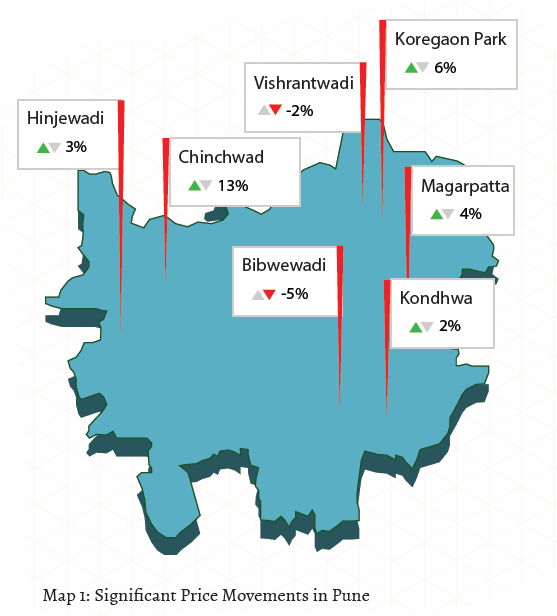 Chinchwad posted the highest rise of 13 per cent in capital values during the second quarter of 2015. Apart from affordability, improved physical and civic infrastructure such as water supply and development of BRTS has pushed the prices up. Phursingi also recorded a significant rise of over 10 per cent in capital values. Proximity to Hadapsar and price competiveness has resulted in demand spilling over to the area. Further, presence of Phursungi IT Park and increased office space absorbtion in the last one quarter have fueled growth in the residential market. Proximity to premium residential locations such as Koregaon Park, Kalyani Nagar and Camp have placed Yerwada high on location attractiveness index. The locality witnessed a rise of eight per cent in Apr-Jun 2015, as against the previous quarter due to increased demand, particularly from the IT workforce. Completion of several residential projects in Pisoli, Hadapsar, Wanowrie & Ambegaon upped property prices. The rental market in Pune grew on the back of a burgeoning IT, manufacturing and education sector recording an average growth of seven per cent in the last one year (Apr-Jun 2015 against 2014). The market remained largely upbeat with over 70 per cent of the tracked localities registering a rise in rental values. Pimple Nilakh has always remained a preferred residential option due to its proximity to premium areas such as Aundh. Completion of several residential projects and setting up of multiple new schools in the last few months has propelled the locality to the top spot in terms of rental growth in the last one year. 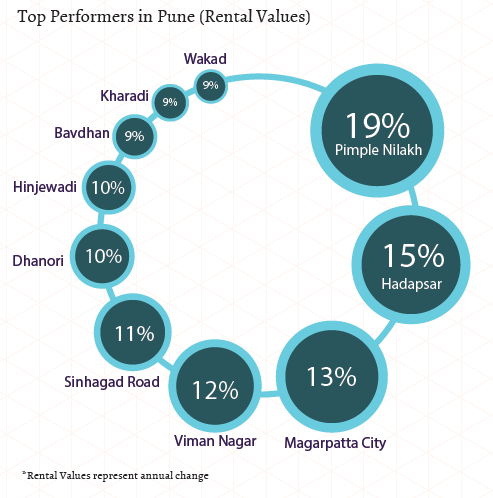 Pimple Nilakh recorded a hike of nearly 20 per cent in rental values in the said period. Localities in the East continued to clock a steady rise in rental values Y-o-Y. Areas such as Hadapsar, Magarpatta and Viman Nagar recorded a rise of nearly 12-15 per cent since Apr-Jun 2014. Affordable areas such as Dhanori, Baner-Pashan Link Road and Singhad Road saw a hike in rental values. 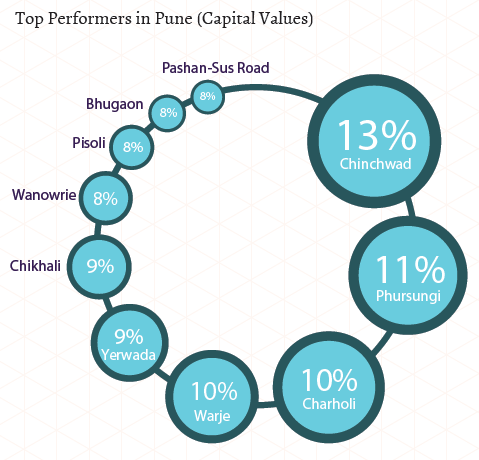 The supply analysis of Pune indicates a large mismatch between the demand and supply statistics of the city. The large number of ready to use residential units available for sale were indicative of the slow rate of transactions in the city. Supply of different property types in Pune – residential apartments, independent houses/villas and builder floors - remained unchanged in Apr-Jun 2015, as compared to the first quarter of 2015. Residential apartments continued to be the most supplied property type across the city forming nearly 95 per cent of the total residential inventory. This was similar to what was noted in Jan-Mar 2015. Maximum supply of apartments was recorded in the high-income housing segment (Rs 60 lakh-1 crore), with close to 40 per cent availability. Independent houses/villas continued to witness low supply in the city. Similar to independent houses/villas, supply of builder floor units also remained modest contributing only marginally towards the total inventory. Supply of residential units was uniformly distributed among the three budget ranges- upto Rs 40 lakh, Rs 40-60 lakh and Rs 60 lakh-1 crore. While properties priced between Rs 60 lakh and 1 crore had the maximum share of supply, the other two categories witnessed a supply of close to 20-25 per cent in Apr-Jun 2015. Almost 70 per cent of the properties in the most supplied budget range (Rs 60 lakh-1crore) were ready for use, while the rest were under-construction. The Rs 40-60 lakh and Rs 1-2 crore budget categories also saw a significant supply of ready to use units, with 65-70 per cent share. Luxury-housing segment having properties priced above Rs 1 crore formed one-fifth of the total residential stock in the city during Apr-Jun 2015. This was a marginal drop of two per cent from the previous quarter. More than 65 per cent of the total supply of luxury properties in the city were ready for use, indicating fewer new projects concentrating on luxury housing segment. 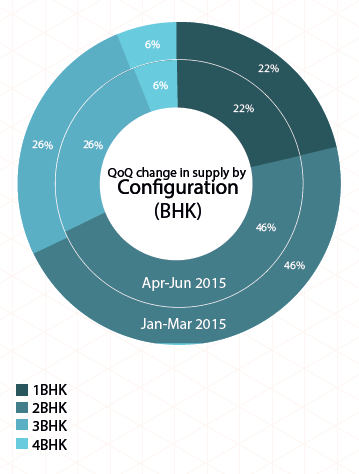 In line with the trend noted in Jan-Mar 2015, 2BHK units continued be the most supplied configuration in the quarter ending June 2015. The category posted a supply of more than 45 per cent. Maximum share of supply in the 2BHK category was ready to use. With over 25 per cent market share, the 3BHK category remained the second most supplied configuration, following the demand trend in the city. Similar to the 2BHK category, nearly 65 per cent of the supply in the 3BHK category was ready for use, indicating a huge inventory pile up. Houses with 1BHK configuration also formed a considerable chunk of the total supply in the residential market. It registered a supply of more than 20 per cent during Apr-Jun 2015, similar to the previous quarter. Supply of properties with 4BHK configuration continued to be limited in the city. More than half of the total inventory in this category was ready to occupy, indicating a slow transaction rate for larger residential units. 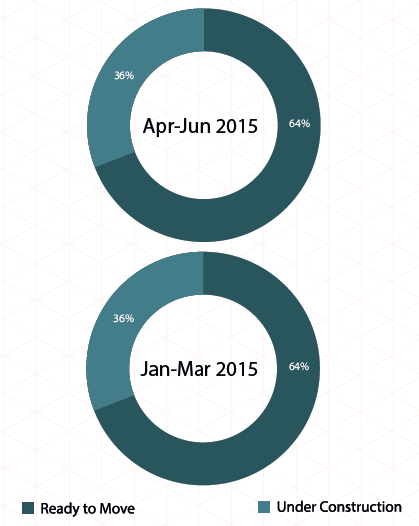 Residential demand in Pune seemed subdued since the beginning of 2015. This was reflected in the large number of ready residential units available for sale in the city. 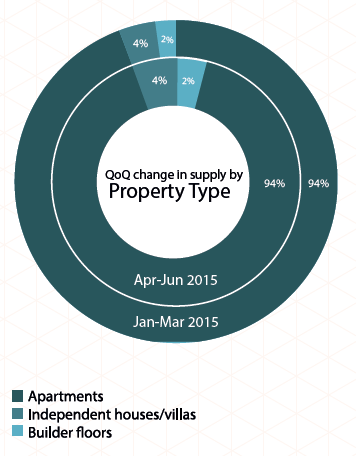 In the quarter ending June 2015, nearly 65 per cent of the total residential stock in the city was ready to use. This was similar to what was recorded in the last quarter. Majority of the ready to use properties (one-third of the total supply) were in the high-income housing segment which is budgeted between Rs 60 lakh and Rs 1 crore. Ready to use units were also available in the budget categories of Rs 40-60 lakh and up to Rs 40 lakh. A healthy supply of over 20 per cent was noted in each of these categories. 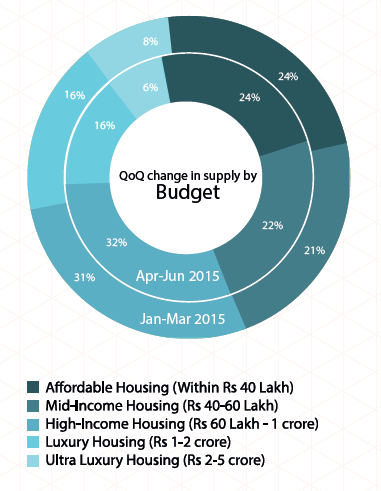 Supply of under-construction properties stood unchanged since the first quarter of 2015 at close to 35 per cent. This indicated the lack of fresh launches in the city. Most of the new stock in the city has been added in areas outside the Pune Municipal Corporation (PMC) limits. As per the realty report by Gera Developers, out of the total new stock added in the past six months between January and June 2015, only about 25 per cent has been added within the PMC limits. This indicates that the city is expanding its horizons to cater to the growing need of affordable housing. What needs to be looked at is how the government plans connectivity links from these areas to popular zones such as IT hubs and business townships in the city. In line with the high demand for 2BHK units, nearly 55 per cent of the total under-construction properties in the city were in the 2BHK category. This was followed by the 3BHK segment, with close to 25 per cent supply.